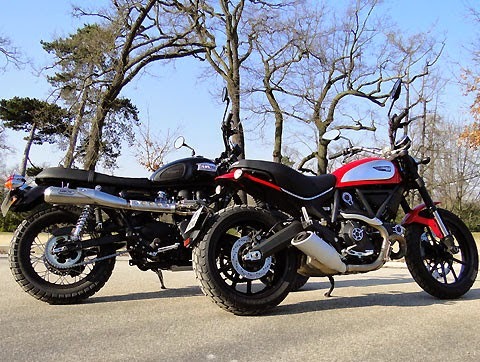 Duel Scrambler: Ducati VS Triumph. With its unique Scrambler, Ducati plunges in turn in the past to take advantage of the current vintage, adding to the charm of retro bikes dynamism offered by some modern solutions. What worried the timeless Triumph Scrambler? Duel. At the BMW R NINET like with his Ducati Scrambler invests with its vintage segment by combining old and new technology lines. With the same goal: to provide a return to the basics of the bike and the basic pleasures felt handlebar hands. 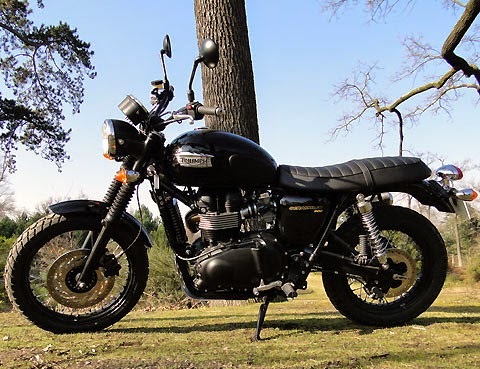 Although closely tied to the past, the approach does not is to live - or revive - classic, as do including Moto Guzzi V7 with Triumph Bonneville with her or with his Kawasaki W800. 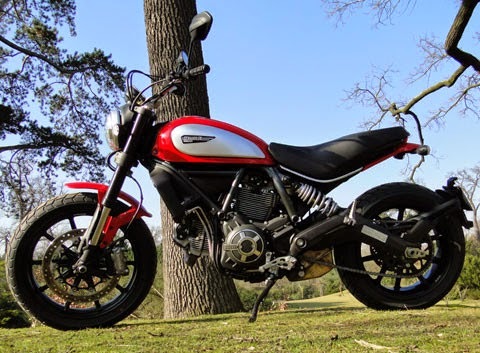 Visually and technically, the Scrambler 2015 wants modern extrapolation of the eponymous model produced by Ducati from 1962 to 1974, and not its reply. 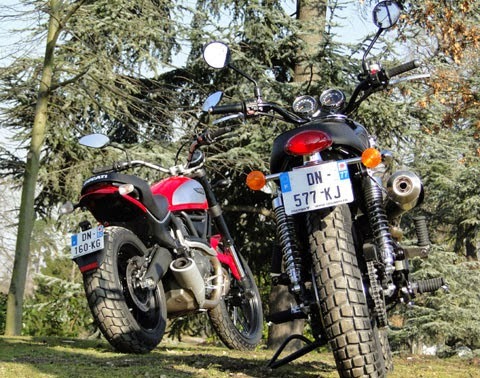 Although the two generations of Scrambler share pavers tires, wide and raised handlebars, a long tank dress with metallic scoops, round headlight and distribution desmodromic mechanical characteristic of Bologna. But the similarities end there. Besides the newest "recycles" the twin-cylinder air-cooled 803 cc of - not so - old Monster and Hypermotard 796, while his grandmother was driven by a single available in 250, 350 and 450 cc. 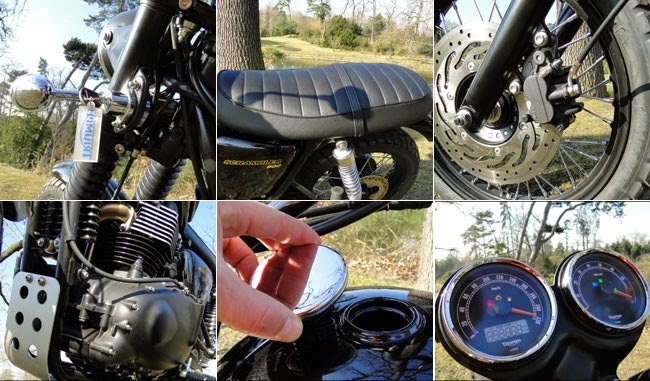 Under these conditions, the words "Born Free in 1962" (freeborn 1962) engraved on the lock cover 2015 new tank cap evokes more marketing trick that a true relationship to the original... Generational split intensifies detailing the Scrambler 2015 its modern curved aluminum swingarm and 41 mm inverted fork sporty - although not adjustable. Its sophisticated LED position lights at the front, its digital instrumentation with handlebar controls and how Diavel deported plate holder are all elements which definitely rooted in the present. 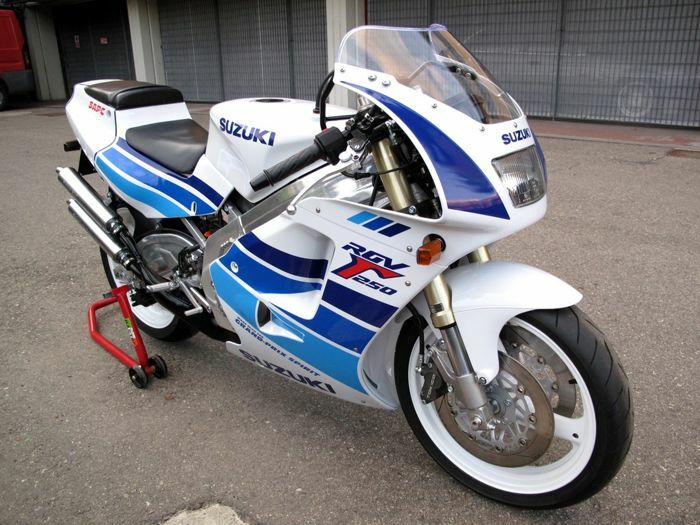 And if the front wheel and 18-inch single brake disc are actually "vintage" (Ducati anyway), the radial-mount Brembo brake caliper and ABS - standard and deactivated - have nothing of "has been"! Nor is the convenient USB socket located under the saddle, where a disc lock can slip the sides marked with a pretty fabric tool kit "Scrambler". Visually, all is pleasant to contemplate and rather refreshing in style. Do not spoil the Italian finish is polished: polished housings and electrical integration neat highlight mechanics, while the quality of the welds trust. Only the "rough cast" stop the throttle cable (above the starter) and the lack of adjustment of the clutch lever grieve by moving the handlebars. Honors for mirrors, as stylish effective, and typed handles motocross, fitting perfectly with this kind of bike. To treat the mood, skid plate would still have been appreciated, especially as the fairly generous suspension travel (150mm front / rear) is an invitation to leave the bitumen. Similarly, the absence of rays and a statement escapement wheels can wince, particularly the short silent rather evokes a sporty roadster that Scrambler. In contrast to this attractive mix of genres, the Triumph Scrambler 900 beautifully interprets its role as legendary production of motorcycle. Its timeless figure refers to the '60s, at a time when manufacturers began to graft their street bikes wide handlebars and high exhaust and tires and off-road suspensions to make small baroudeuses. Extremely popular, this kind called "Scrambler" yield over the next decade instead to "trails" for off-road abilities superior, like cult Yamaha XT500. 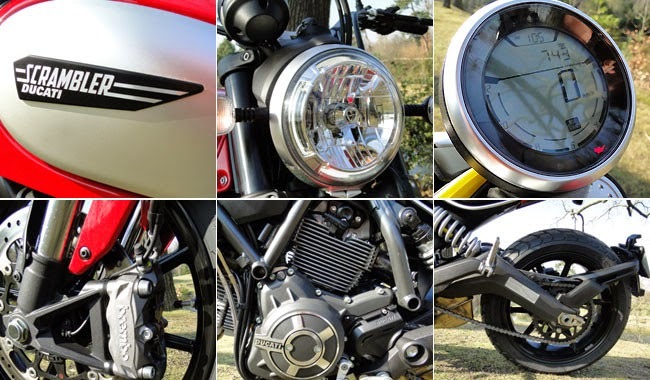 Pampered in every detail, the Scrambler 900 provides quality achievement above all suspicion, in the image of its quality hardware (a constant at Triumph), its openwork aluminum shoe and its surface treatments cared. Its domed tank of 16 liters with knee grips, quilted saddle, his fork gaiters or its chrome-absorbers combined transport at first glance decades back ... Before a closer look detects injection ingeniously hidden in fake carburetors! No matter what subterfuge: the magic and the fans of Steve McQueen same rejoueront under their helmet impressive scene cult of the Great Escape 1963, when the American actor (or rather its lining, Bud Ekins) jumps to the top of a barricade with TR6 makeup motorcycle of the German army! This inevitably will freeze grin daily as this provision is impractical. The same applies to the fuel cap without a hinge and lock, the painful leg to unfold (like Italian) and the lack of storage space under the seat! We will console with its analog instrumentation, but certainly less provided more readable than the remote dial of the Ducati and tiny numbers. Technically identical to the Bonneville, Triumph Scrambler is essentially characterized by its engine timing: her twin cylinder 865cc air-cooled oil is calibrated to 270 °, not 360 like the "Bonnie" and Thruxton. Incidentally, the power of the Scrambler 900 was 59 hp - 68 hp against the two other representatives of the range "Classic" Triumph. This different timing also affects the sound of the rigid block mounted in the simple steel frame cradle, making it slightly less "round" and backfiring. Nothing, however, donating because the sympathetic soundtrack is very - too - theoretically stifled despite improvements made in this area last year. This sound shyness is all the more frustrating that our test model was equipped with an optional complete exhaust "2-in-1" approved, including in pollution through specific lambda probes. Not overly expensive (€ 1,029 excluding installation), this equipment is designed by Arrow for the Triumph Scrambler and therefore keeps the collectors "crusaders" in front of the front cylinder. Too bad it does not give more votes to the engine (at least with baffle "dB Killer" required for approval ...) because this exhaust is simply beautiful. And if some prefer the charm of the original dual output but ranting against his heat release, they reassure one another as much burn thigh stopped! Gare also to plasticized textile pants that can melt on the pipes of the Arrow line, for lack of a plate long enough thermal protection.